There are 5 other images of this object. See our image rights statement. See more objects with the tag decoration, domestic, timekeeping, modernism, tool, minimalism, simple, wall, neutral colors, atomic. See more objects with the color darksalmon burlywood dimgrey rosybrown gainsboro or see all the colors for this object. 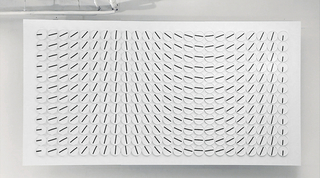 This is a Wall clock. 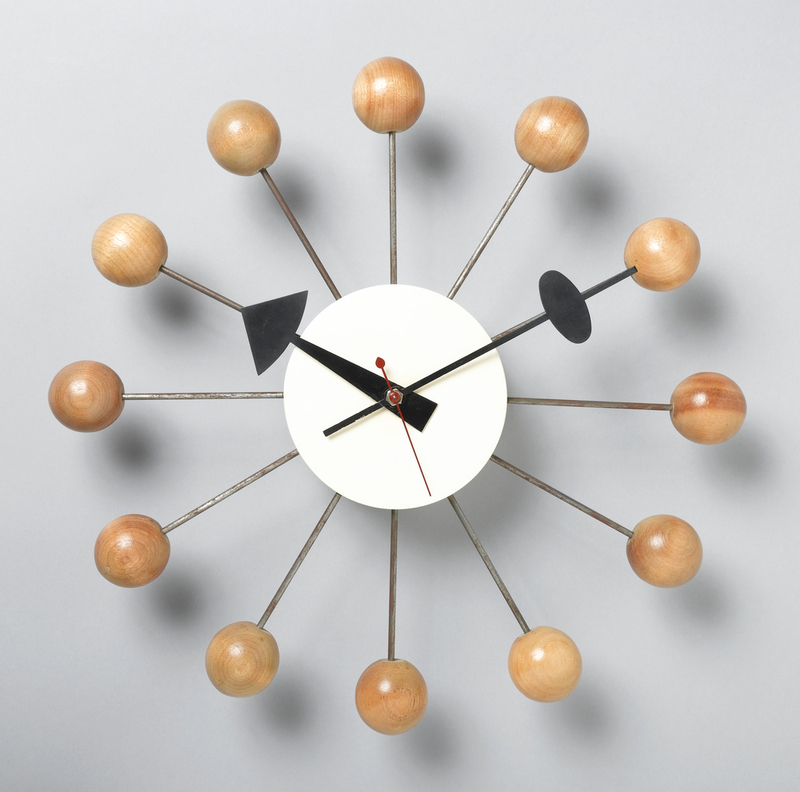 It was designed by George Nelson and manufactured by Howard Miller Clock Company and Herman Miller Clock Company and firm: George Nelson and Associates. It is dated 1949 and we acquired it in 1991. 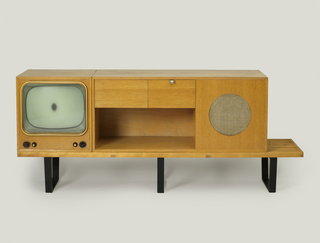 Its medium is assembled wood, painted wood, steel rods, sheet metal. It is a part of the Product Design and Decorative Arts department. 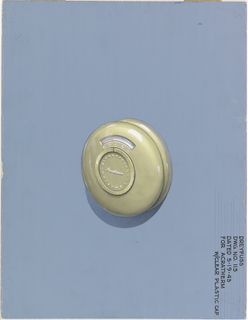 The Ball Clock, part of the Chronopak series of electric wall and table clocks by George Nelson Associates for Howard Miller Clock Company, is an example of the playfulness of 1950s designers, who moved away from the severe functionalism of prewar decades. It also reflects the short-lived fashion after World War II for motifs related to atomic models and the nuclear age, offered here in a lighthearted, cartoon-like style. This object was donated by Mel Byars. It is credited Gift of The Mel Byars Collection. brush and gouache, graphite, pen and black ink on illustration board. 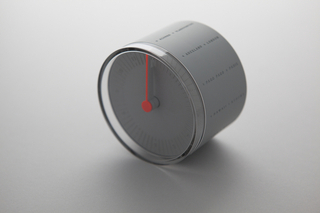 aluminum, electric components, powder-coated clock hands, screen-printed dials. Courtesy of Victory Hunt Designart Dealer. Courtesy of Cloudandco / Yeongkyu Yoo. 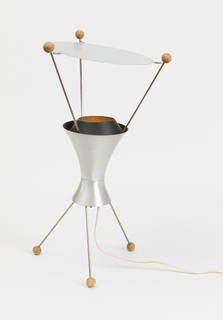 spun aluminum, enameled aluminum, stainless steel rods, cork. walnut veneer on pine, tubular steel, leather, perforated sheet aluminum. 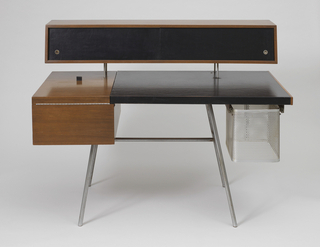 combed oak, lacquered wood, glass, molded plastic, aluminum, linen. This object was previously on display as a part of the exhibition	Pixar: The Design of Story.